Our Magento 2 custom shipping method extension provides two essential functionality for Magento store owner to fully take control of there store shipping options by providing the ability to quickly add custom shipping rates to both admin order creation or frontend customer. Want to add order package tracking to your Magento store? Learn more about our Order Shipment Tracking for Magento 2 extension. 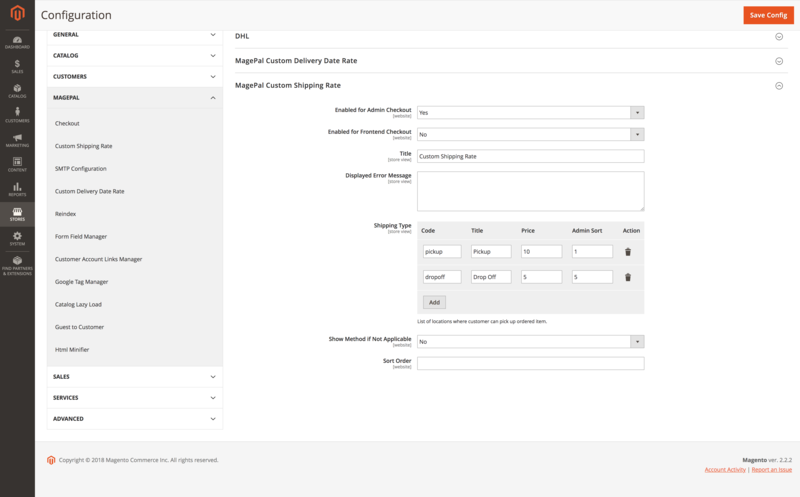 Whether you are creating a new order or canceling and rewriting existing orders in Magento Admin, our admin shipping extension gives you the ability to apply a custom shipping rate, method, and description to any order. This free extension is essential for businesses that do a lot of phone orders or mail orders and want to offer special shipping cost for individual customers. With our admin shipping plugin extension changing shipping amount for a particular order is as easy as entering the shipping amount instead of choosing predefined standard shipping rates and invoice your customer as you would with any standard shipping rate. Setting up our shipping method is as simple as entering four options for your different rate. Want to contribute to this extension? The quickest way is to open a pull request on GitHub. For fast Premium Support visit our Custom Shipping Rates product page for detail. If you encounter any problems or bugs, please open an issue on GitHub. Need help setting up or want to customize this extension to meet your business needs? Please email support@magepal.com and if we like your idea we will add this feature for free or at a discounted rate.